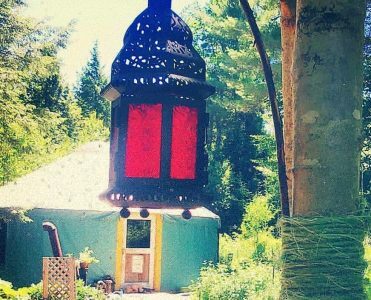 7 Quick Takes: Yurt-stead Studio – Y is For Home! November is such a creative month! Despite all the winter-prep we’ve still to do (warm weather has lured us into leaving everything to the last month of autumn), we’re prioritizing artistic pursuits instead! The whole season is ideal for writing, painting, and redecorating, but November – all wrapped up in transient beauty and memento mori – is the pinnacle. We’re cozy inside under grey skies today, watching the trees dance in the wind and listening as the occasional rain drowns out all other sounds – if you’ve never been in a yurt during a rainstorm, its fantastically loud! So here are 7 (shamelessly self-promoting) peeks into our autumn artist-life! Recently commissioned St. Raymond of Penafort, doubled..and now off to his new homes! He is the patron of Canon Lawyers and delightfully strong-willed! We loved getting to know him this fall. Seth is painting St. Brigit of Sweden – a commissioned piece for Christmas. One of the things I love about his commissioned icons is getting the chance to meet new saints! We’ve had so many pass through our little house this year, and I like to think they all leave us with a little blessing! I know next to nothing about Brigit of Sweden, but as she comes to life under the brushes I feel that changing. Our house is always full of paints and wooden panels, brushes and murky jars of paint-water..But especially this month, with Christmas coming soon, we have sketches and half-alive folk icons in every nook. It’s fun to feel the church triumphant gathering, a bundle of celebratory relatives spending the pre-holiday months in our little house and toasting the up-coming birthday of Christ! Last weekend we hosted our first (annual?) Yurt-to-Table dinner party. Invitations, masks, roasted pork, savory galettes, and so many friends made it a lovely party! We had so much fun transforming the yurt into a space that could accommodate our little crowd, mixing up a local gin and home-brewed kombucha cocktail, and getting enough lighting for the early sunsets of late October. I love hosting. I little parties of people who can gather comfortably together and celebrate anything and everything! Next year I hope to host the yurt to table dinner earlier in the season, and earlier in the day, to make it a longer, slower meal – with a few more activities for the kids maybe. But overall I was so happy with the whole event! All Hallow’s Eve is one of our favorite holidays here! Yarrow and Ilya are already talking about next-year’s costumes! This year, we decided to dress up as a family: Yarrow was little red riding hood, Ilya was a tiny huntsmen, Seth was the big bad wolf, and I was grandma.. They had such a fun time trick-or-treating in the towns nearby! We have to drive a bit to get somewhere with enough of a neighborhood to do any trick-or-treating, but it’s aways worth it. The kids love being out with all the other kids, all dressed up and sort of wild together! Along with blogging here, and homesteading, and homeschooling..and all our other little pursuits, I’m now a contributing writer at a new blog: Bonum Vitae! I am so excited about this project: to forge a..more thoughtful, more authentic, more virtuous..path in prevailing culture. Our lovely new digest is just getting started, but keep an eye on it! We have a fantastic collection of writers, a passion for beauty, and a healthy variety of opinions within the unifying journey toward the good life. November being the month of All Souls, we have been including the full prayer for the ‘faithful departed’ in our evening devotions. May the sold of the faithful departed, through the mercy of God, rest in peace. Praying for the dead this way every evening has reminded up to find little ways to reach out and welcome our own dead as well as those who have no one to pray for them. We have bread and water on our little family altar in hospitality toward those neglected souls, and as a reminder to keep them close to us this season. We have little skull candles around the house (all year, actually, but especially now) as a reminder to welcome them and pray for them on their way to heaven. Nanowrimo 2017! I’m actually doing it this year, after 2 years of almost jumping in and not getting anything done at all. I’m behind in my writing, because..well..I’m writing a lot right now all over the place. But I’m plugging away at it! I am cheating a bit though because it isn’t actually a novel that I’m writing (nanowrimo is National Novel Writing Month). I’m writing what I hope will be a mediative reflection on the faces of Mary through the hours of the day. I’ve been planning it and working carelessly on it for months, but nanowrimo is my excuse to focus intensely on the project! Instagram is addictive. I’m on it as @beautifulcrows and now my husband, @paperwinestudio has picked it up for his artwork! With the two of us instagramming, when the data actually connects and the tablet is charged, the internet will be flooded with photos of #yurtlife! I do actually love the opportunity to share the beauty and joy we’re living with the world. It feels like a more welcoming space that facebook, most of the time. And I am constantly inspired by the lives of the people I follow there. Check us out if you like adorable kids, beautiful artwork, and the off-grid, yurt-life! Lovely post, and really nice pictures!